This beach at the eastern end of Misquamicut is across from water slides and other amusements. Ample affordable parking available. 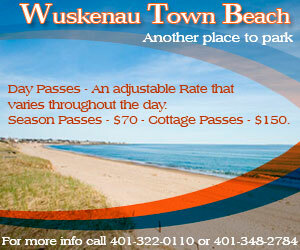 This small beach on the Weekapaug breachway offers full amenities at an affordable entry fee. 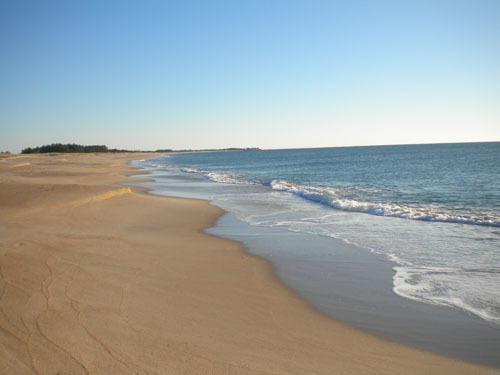 Its large stretch of smooth, sandy beach running the length of Atlantic Avenue, Misquamicut (from an Indian word mean­ing 'red salmon at this place') is Rhode Island's largest state beach. It has moderate surf, good-sand with a gradual drop-off and moderate undertow. 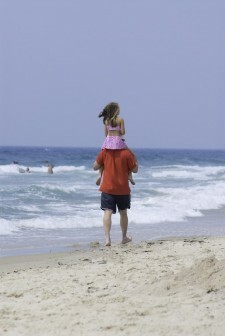 Lifeguards are on duty all season, and the beach has areas for body and board surfing. A large, new pavilion, which is accessible to people with disabilities, has a central observation tower, restrooms, showers, first aid and refreshments. Atlantic Avenue is alive with motels, cottages, restau­rants, gift shops, amusements, water slides, miniature golf courses and a concert hall. Parking is available for 2,700 cars, and there is a daily fee. 401-596-9097. Splendid isolation characterizes this beach. Beautiful and unspoiled, this sandy spit separates Watch Hill’s Little Narragansett Bay from the ocean. Its conservation area is a haven for nature lovers with its breath-taking ocean views, and it’s a favorite of hikers and bird watchers. This area is home to osprey, American oyster catchers and piping plovers. The area is one of the most important migratory bird stopover points on the East Coast and provides a year-round habitat for a variety of species. Napatree Point Conservation Area is acces­sible from two paved parking lots on Bay Street. Free. This clean, pretty beach has an antique carousel, private bathhouses and shops nearby. No on-street parking; patronize private lots. 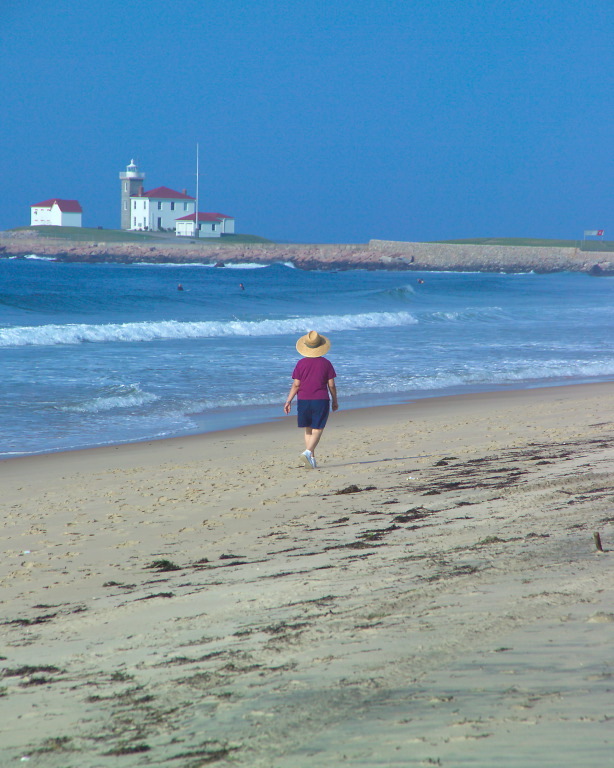 A public right of way leads from Bluff Road to this long, lovely beach that stretches from Watch Hill Lighthouse past the Ocean House Hotel. Portions of the beach on either side of the right of way are private. No amenities of lifeguards. Paid parking is available in a lot on Larkin Street. Access to the western end of this lovely conservation area is controlled by the Quonochontaug Beach Conservation Commission. Public access to walkers only is permitted by a sand trail that leads eastward between the beach and Quonochontaug Pond. It is a pristine set­ting; however, it's a long walk, and there is no nearby parking for nonresidents. Located near Weekapaug at the end of 651 Atlantic Avenue. For members only. A primitive gateway to a beautiful stretch of barrier beach is at Westerly's Weekapaug Fire District Beach, west of Quonochontaug. 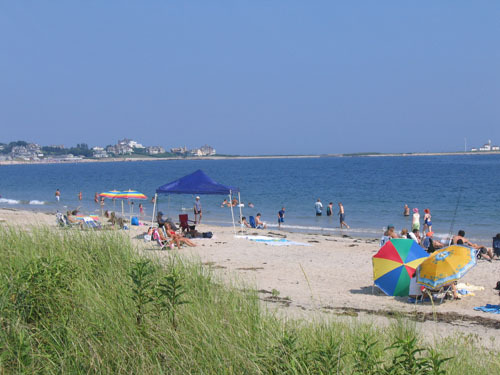 Residents own the beach and private docks at the end of Spring Avenue, but public access to the sand trail by vehicle is permitted from Labor Day to Memorial Day (with four-wheel drive along this narrow lane of soft sand). Considered a private conservation area, there are no public facilities along these dunes. 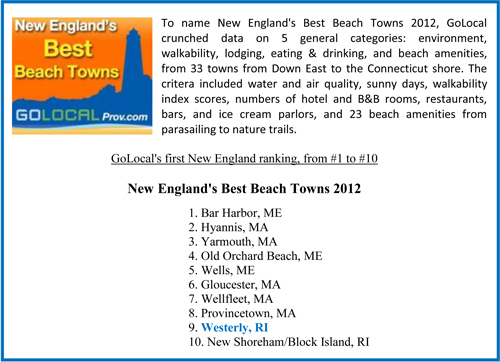 The area offers clear views of Long Island and Block Island. Limited public parking is available at Weekapaug Breachway. This private beach at 365 Atlantic Avenue is provided by the Town of Westerly for property owners. It includes concessions, rest facilities and picnic tables. Lifeguards are on duty from Memorial Day through Labor Day. Parking stickers are required and may be purchased at the Town Hall.